The 804 Series is a line of self contained, fully portable air conditioning units suitable for single connection aircraft throughout the world. The ACU-804 has sufficient capacity to achieve and maintain comfortable cabin temperatures on any narrow or medium bodied aircraft in any climate. The simple but rugged design consists of a diesel engine directly driving for refrigeration compressor and blower. 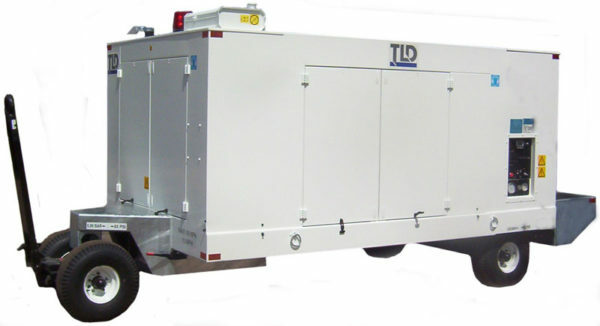 This is the unique “TLD Direct Drive” technology. Additionally, a hydraulically driven condenser fan exhausts waste heat directly upward making it immune to performance fluctuations due to varying wind conditions and minimizing heat and noise radiated to the immediate ramp area. Available as a stationary skid-mounted unit or mounted on a 5th wheel trailer. Note: Sales territory restrictions may apply, please contact us for more information. Rotary Screw Compressor - variable capacity rotary screw continuously adjusts its pumping capacity to accommodate the demand. This component is designed to operate for 50,000 hours before requiring major service. Emission Certified Engines - choice of Deutz or Cummins diesel engines. Heavy-duty industrial engines rated for continuous duty provide ample power in all operating conditions. Engines are selected to meet current and future U.S. EPA and European COM emission standards. Automatic Capacity Control monitors unit output and cooling demand and adjusts capacity to provide efficient operation. Simplified Operating Controls provide an operator interface common to other TLD-ACE equipment. Adjustable Outlet Damper for single-handed control of outlet flow & pressure. High Capacity Centrifugal Blower supplies abundant airflow and delivery pressure to accommodate modern aircraft. 24 Volt Electrical System for trouble-free control operation and commonality with other industrial equipment. Heavy-Duty Steel Fuel Tank is sized for at least eight hours of continuous operation under any operating conditions. Industry Proven R134a Refrigerant is recognized as having Zero Ozone Depletion Potential and is considered environmentally acceptable in all regions. Additional, because R134a inherently operates at a lower pressure for a given temperature than R22, an R134a system maintains much more of its operating efficiency in extremely hot ambient conditions.